Austin Here We Come: Fan Site Summit 2 Announced! You may have thought that convention season was over. And for the most part, it is. But with no conventions remaining, where will the big info drops come from between now until launch of the game on December 20th? Well, we’re happy to tell you BioWare has saved the best for last. Ask A Jedi is proud to announce that BioWare has extended an invitation to us for the second time this year to attend the Star Wars: The Old Republic Fan Site Summit held at the studio where the game is being developed in Austin, Texas! 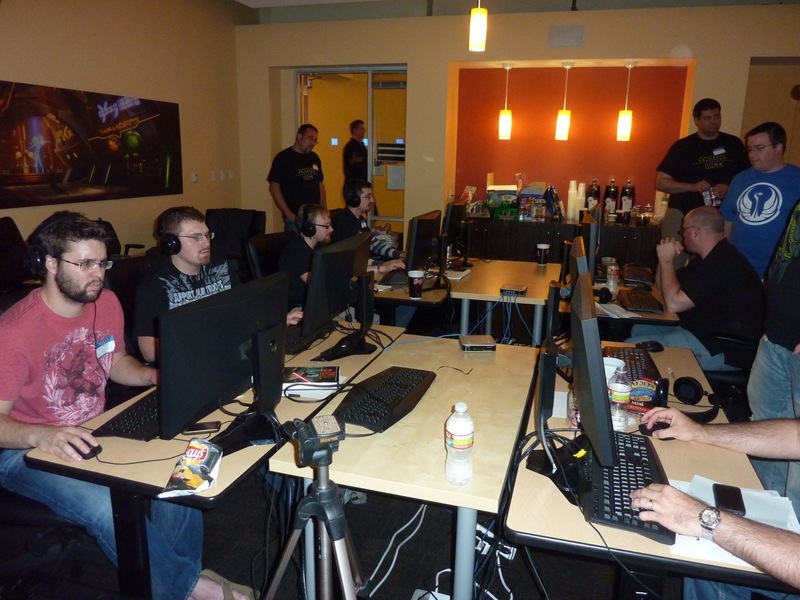 Last April, we were honored to be a part of the first-ever Fan Site Summit, in which about 15 sites from around the globe descended upon Austin to get 2 days worth of hands-on time with the game and up-close access to the developers. Given the attendees, the content that came out of that event was easily some of the most detailed and complete. The 2nd Fan Site Summit takes place next week, November 6-8, 2011 and AAJ will be there in full-Force to bring rock solid coverage, interviews, furniture and anything else BioWare let’s us take home! Also, keep your eyes peeled around the web, because the other invitees will be announcing their attendance soon. When they do, we’ll add them to the list here so you can make sure you’re following everyone and getting every last nugget that comes out of the Summit! If you have any questions or requests, let us know in the comments below or better yet, stop by the all-new Ask A Jedi Cantina and ask! The Fan Site Summit in April. Get ready for round #2! Well I am excited for the Fan Sites! In the last few weeks we saw the general gaming sites dump their opinions/observations all over the web about the game. I can hope that Bioware decides the Fan Sites deserve to be ‘unleashed’ in their NDA-ishness. We can really see the disciples of this game out in the gaming word preaching the gospel of SWTOR !! Aye! I agree with you 100% Zlatto! The fan sites are most excited to share their coverage to the fans of Star Wars: The Old Republic! I’ll be on the Cantina, Mumbling away from 6:30 until 8 or 8:30, so if you have questions you want asked, feel free to pop in then and let me know what they are! Excellent idea. And as one of the editors if Momus isn’t around and you see me on Mumble feel free to leave your question with me. I’ll make sure Momus gets it. We’ll ask them…if there’s time. We have important things to do, apparently. Dangit…ate my quote…Bass said we’re doing laser tag. Well every blue milk and cereal are potential questions so start from there and ask them. With the votes results so you have numbers to show. Some questions about reverse engineering too but I guess it’s already on the list. Not to be a “hater” but why would DarthHater be considered a fan site? They are a for profit arm of Curse, which is more of a press site than a fan site ? Congratulations guys! And if you at all get a chance, ask them if they already have an ETA on putting in the same gender romance arcs. I am in the Cantina if anyone cares to talk! If no one does, the next Friday video update might be a link to Epic Saxophone Man. Soooo you’re encouraging people to not come talk in the Cantina? Because epic sax man is a reward where i come from! Would be awesome if you guys could get more coverage on these three. I’ve got a question for ’em: ask about the ability to change AC after choice at level 10. It’s been awhile since we heard about that, and the radio silence has led to a lot of rumoring and misinformation. Have they settled on anything or are they leaning a particular way on this issue?